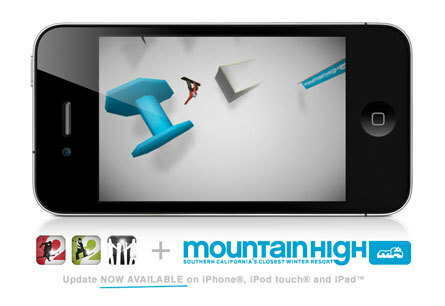 Mountain High - Ride Mountain High on Your iPhone – Free! Ride Mountain High on Your iPhone – Free! Wrightwood, CA – September 9, 2011: Fans of Southern California’s Mountain High Resort can now ski and snowboard its famous runs for free on their Apple iPhones, iPod touches, iPads, and Macs, as well as online from all internet-connected computers at http://playmytp.randerline.com. 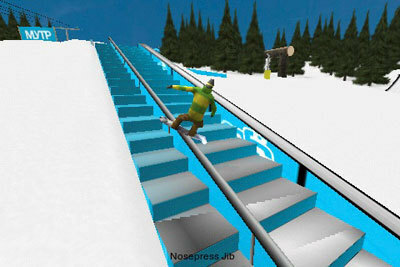 Mountain High is the only North American resort, and one of only three resorts in the world, to be featured in version two of the popular MyTP snowsports games, MyTP Snowboarding 2 and MyTP Freeskiing 2. Mountain High now shares the MyTP game screen with Austria’s Flachauwinkl resort, an internationally renowned snowboarding and freeskiing destination in the Central Eastern Alps, and Laax resort, a snowboarding mecca in the Swiss Alps and site of Europe's largest halfpipe. Also featured are wide open runs of backcountry Alaskan powder. The latest versions of the MyTP snowsports games deliver incredibly realistic presentations and introduce snowboarders and freeskiers to Mountain High’s legendary jump lines, signature jibs, and pure & simple powder. They are great for the ride up or those days when one just can’t make it to the mountain but wish they were knee deep in freshies. Game players can select from up to eight males or females and create individually “styled” characters. There are 36 levels with varying degrees of difficulty and players can attempt more than 500 tricks, either in solo or competition mode. The games’ "multiplayer" feature lets players challenge each other no matter how far they are apart and players can chose from multiple options to master new tricks and demonstrate their own personalized style. The games feature realistic 3D graphics and are optimized for the high resolution retina displays of the iPhone 4 and iPod touch. The controls are either tilt- or joystick-based allowing for endless downhill action, and players can replay runs, take snap shots, and post their best tricks to online galleries or social media sites such as Facebook. 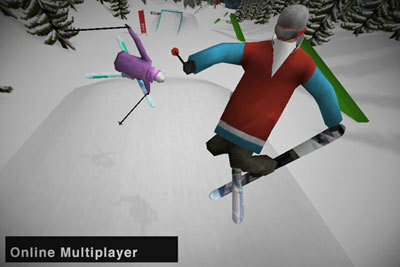 Players can also listen to their own music via the same Apple device on which they are playing the snowsports games. The beginner levels of each resort are free, and players can download higher levels for $.99 or the full package for just $1.99. The MyTP Freeskiing 2 and Snowboarding 2 apps are available on the App Store at http://go2.mytpsnowboarding.com and http://go2.mytpfreeskiing.com, respectively. The online webplayer edition can be found at http://playmytp.randerline.com, and the Mac App Store Edition is available at http://playmytp.randerline.com/go.